Are you missing out on one of the most transforming means to a deeper and more vibrant faith? 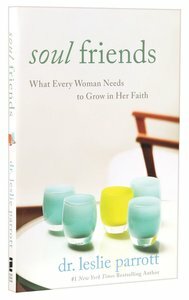 In Soul Friends, Dr. Leslie Parrott explores the intimate stages of a woman's spiritual journey while showing you how soul friendships can deepen and enlarge your faith. God brings us soul-friends to help in our spiritual journey, sometimes in predictable places: small groups, friendships, and mentors. But they're sometimes found in places we don?t expect?these ?hidden guides? are people, past or present, whose role in our life may even be hidden from them, but nevertheless, have a deep impact on our growth and vitality. Whether it's a hidden guide, a member of a small group, or a friend we've had for years, these soul-friends all hold the potential to embody grace that enables us to take a next step in the unfolding journey of our faith. When we seize the initiative to connect, together we will form a part of the deep communion that is the sisterhood of the traveling saints, journeying together in our desire to know God, serve him, and love him more deeply. Through story, poem, and reflection, Leslie Parrott reminds each of us of the incredibly intimate, intricate, faith-forming work God does in us through the gift of the women he places in our lives. Customer Reviews For "Soul Friends"
This was a surprising book. It is written in four sections with each section having a number of chapters which were only a few pages long. It is the sort of book that you could use as a devotional. It is a mixture of good teaching and poems. It is a refreshing little book to read. I read it as an ebook but it would probably be a good book to have in print so you could read snippets often.